I came across an article by Mark Johnson about the experience of a 17 year old child released from prison which illustrates how so many children, women and men released from prison are set up to fail. Ex-con criminologists Richards and Jones have coined the phrase the Perpetual Incarceration Machine to highlight how those who experience imprisonment find it incredibly difficult to escape the grip of the carceal system. In attempting to re-establish lives in the community ex-prisoners face a series of barriers that significantly increase their chance of returning to prison - they are set up to fail. In the 1980s I worked an organisation called Hargrave House which provided housing to ex-cons. The organisation had been set up by PROP - the prisoners rights group involved in many of the struggles within prisons in the 1970s and rejected the idea that ex-prisoners needed control and supervision. Instead Hargrave sought to its residents gain access to social resources, such as housing, employment and health services. 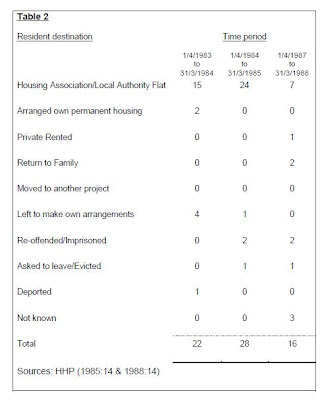 The table below shows the "outcomes" for Hargrave residents. Without supervision, risk management, treatment or other control techniques very few returned to prison. By putting our efforts into getting access to Housing Association and Local Authority housing most got a stake in the community and managed to escape the criminal justice system.